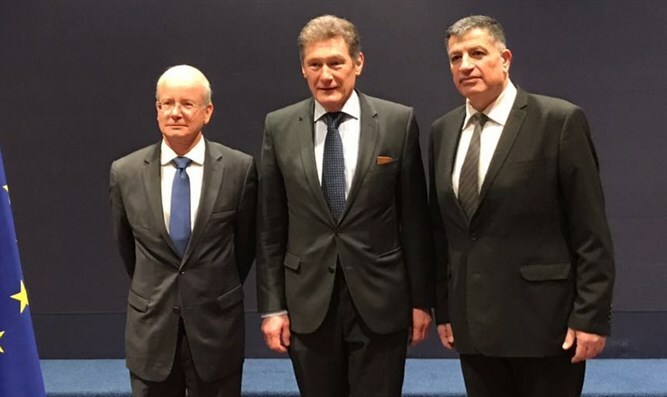 IDF General Yoav Mordechai meets with EU ambassadors, reprimands them for ignoring bodies of IDF soldiers held in Gaza. Coordinator of Government Activities in the Territories (COGAT) head Major General Yoav Mordechai met today with 28 ambassadors of EU countries and dozens of other diplomats as part of the EU Security and Policy Committee. Maj. Gen. Mordechai spoke with the diplomats on issues related to the Middle East. "I sit before everyone present in this distinguished forum and am amazed that for years no one has spoken and no one in the European Union has addressed the Israeli humanitarian issue," he said. Mordechai was referring to the European Union's disregard for IDF killed-in-action and hostages in Gaza. "There are two IDF casualties whose bodies have not yet been returned to their families, as well as two Israeli civilians. While we are working to assist the Palestinian population on the humanitarian level, it is only natural that we expect international pressure to solve the Israeli humanitarian issue." "I demand that you strive to put effective pressure on the terrorist Hamas entity and the Palestinian Authority, which since the reconciliation with Hamas has also been responsible. I say to the European Union and the international community: Live up to your principles, even in terms of respect for international law."